King's Road Brewing Company in Haddonfield has hired gold-medal brewer Matt Revier of Haddon Township. Credit: Matt Skoufalos. King’s Road Brewing has found its brewmaster in Matt Revier, a Haddonfield native and Great American Beer Festival gold medalist. 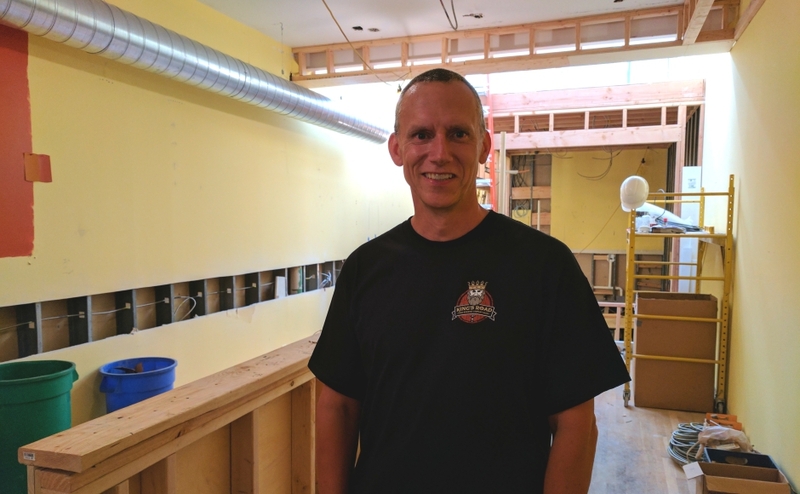 The brewery opens this fall on Kings Highway in Haddonfield. Matt Revier of Haddon Township will join Haddonfield nanobrewery Kings Road as its brewmaster. Credit: Matt Skoufalos. When Matt Revier got his start in the craft beer industry, there were only a handful of independent breweries in the Philadelphia area. Stoudts was the first to give him a chance, and Revier started at the very bottom, earning a dollar for every keg he washed and refilled. Some days, he walked with $20; others, it was upwards of $100. He commuted an hour each way for the opportunity, renting an efficiency that was so dilapidated he allowed neither his parents nor his fiancée to visit. But Revier also immersed himself in the business, reading every book and magazine that he could get his hands on, and “being kind of a pest” to other brewers as he lobbied for more responsibility. When a brewing position opened up at Stoudts five months later, brewer Bill Moore spoke up for him. Two years later, Moore gave his protégé another important boost, connecting him with the founders of Valley Forge Brewing Company, who were looking for a brewer around which to build their Wayne, PA brewpub. 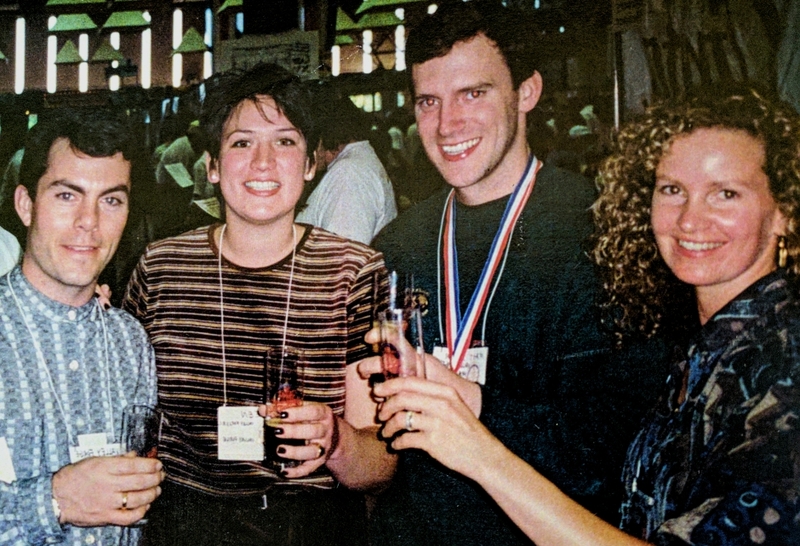 Revier (second from right) and his wife, Eileen (second from left) celebrate his gold medal win at the Great American Beer Festival in 1996. Credit: Matt Revier. “That’s where I made my mark,” Revier said. At Valley Forge, Revier turned out a number of popular beers, none more so than his Grand Imperial Stout, which beat out 60 other strong ales for a gold medal at the 1996 Great American Beer Festival. Two years later, Valley Forge’s Peach Wheat Ale took first place in the flavored wheat category at the World Beer Championships. Success begat more opportunities, and soon Moore called Revier with an invitation to join him at the fledgling Independence Brewing Company. There, they landed another Great American Beer Festival gold medal, for their Franklinfest Oktoberfest beer. Despite the wins, a top-of-the-line production facility, and strong financial backing, Independence couldn’t find its footing, and Revier was looking for another job in the beer business after a couple years. He latched on with Ortlieb’s for a bit in 1999, but, deciding he needed a more stable career, took a position with Ocean Spray. Revier has been an industrial beverage-maker ever since. But he’s also kept a weather eye on the microbrewery industry, and believes in the potential of King’s Road Brewing Company to make an impact. 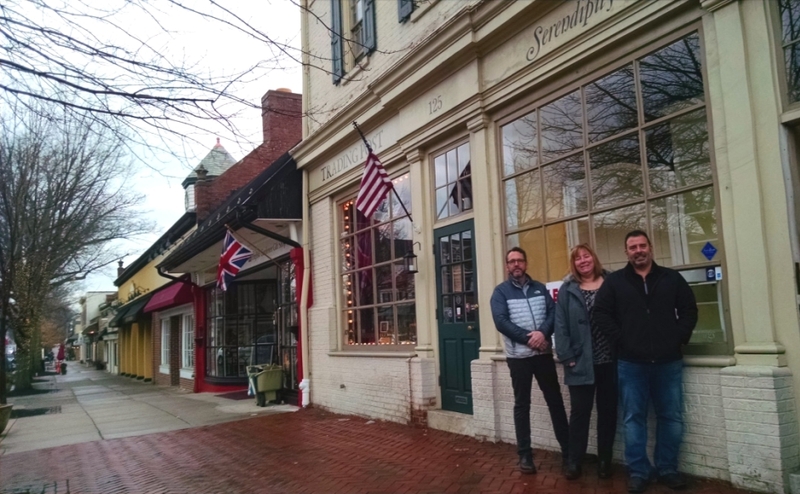 From left: King’s Road co-owners Chris Thomas, Vicki Jensh Cummins, and Bob Hochgertel outside the future site of their brewery in downtown Haddonfield. Credit: Matt Skoufalos. “A lot of people want to know what’s going on with this place that’s going to be hopefully a bedrock of Kings Highway,” Revier said. 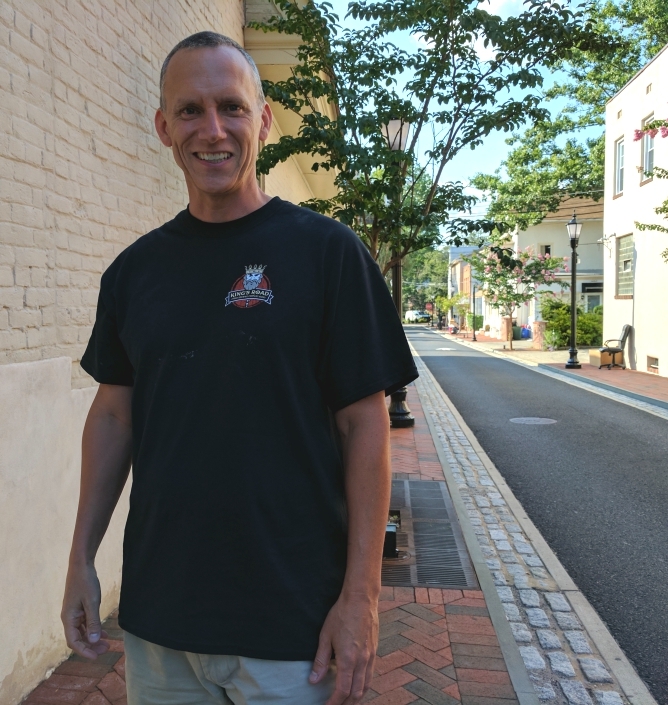 To be brewing in the town where he was raised, in a historic building that originally functioned as Gibbs Tavern, is “dreamlike,” he said. Revier is excited for the opportunity to create a local destination for beer lovers; he said he wants to experiment with beer varieties in a small-production format, and to engage with customers one-on-one. He offered few specifics about the beer list—customers might expect an IPA, a variety of ales, possibly an Oktoberfest—but spoke at length about how much of a part he expects the production process to play in the experience at King’s Road. 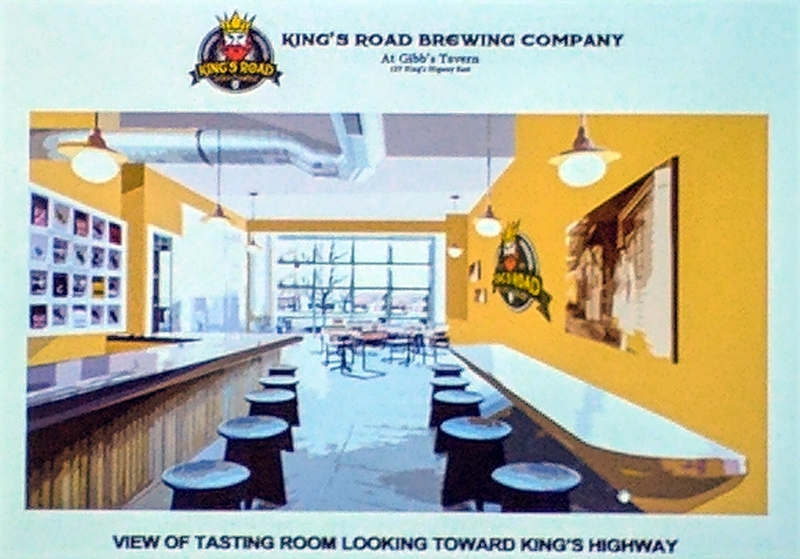 Interior rendering for King’s Road Brewing Company in Haddonfield. Credit: Matt Skoufalos. “You should see a working environment,” Revier said; “somebody in there making beer, being visible. As the brewery continues its build-out for a fall 2017 opening, Revier is hoping to build himself a permanent foothold on Kings Highway. He thinks the nanobrewery will fit right in with the local craft beer community in Camden County, which includes Tonewood Brewing in Oaklyn, Devil’s Creek in Collingswood, Eclipse Brewing in Merchantville, Forgotten Boardwalk in Cherry Hill, the planned Red, White, and Brew in Audubon, and Lunacy, which is slotted to find new digs in the shuttered Window Factory building further down King’s Highway in Haddon Heights. “I feel blessed,” Revier said. “It feels just right. Get more local news that matters. Check out NJ Pen on Facebook and and Twitter, or click here to become a supporter.